The daily briefing is at 10 o’clock. The weather forecast will be commented and explained by Klaus or one of our members. Feel free to take the opportunity to share your flight experience – successes or difficulties encountered as well as your aeronautical knowledge, making this a lively and interactive moment. For those who missed this crucial moment, a touch pad screen is available 24/7. 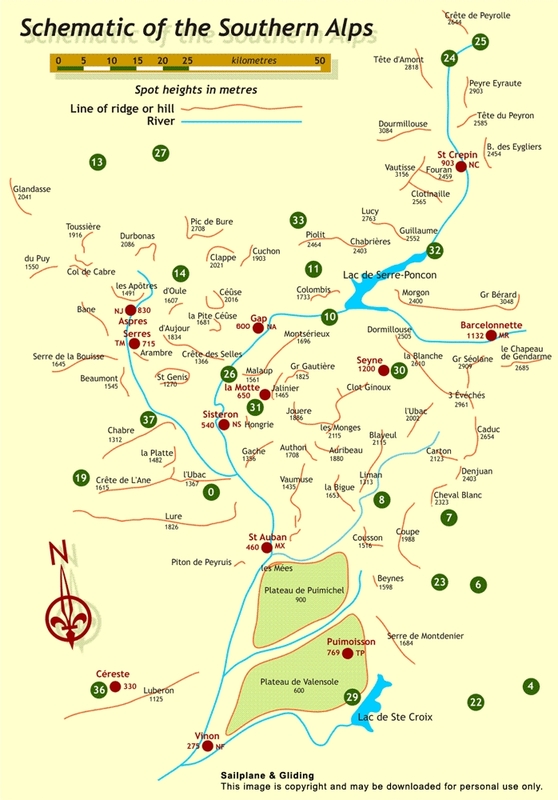 as well as the airfields and there QNH altitudes – in red. Soon the Southern Alps will have revealed all their secrets! This card is given to you at the reception desk. It is used to bill your tow. However, its main use is a security means to assure the pilots returned from the daily flight. The tow card has your pilot number, your surname and your first name, the type of glider you’re flying, it’s registration id, your mobile number and where you are lodging. Your Eagles towing card is given to the tow pilot at the end of the day it will be deposited in the mailbox at the entrance of the campsite. You must retrieve your card in the mailbox after your flight or at the latest 30 minutes after the aeronautical sunset. Indeed, if the card remains in the box, it indicates you haven’t returned to the airfield. We will call you on your mobile to make sure you haven’t forgotten it. If you haven’t warned the tow pilot that you have outlanded, or landed on an airfield, a search and rescue plan will be triggered. If you have a self-launcher, you must leave your card in the mailbox prior to your flight and retrieve it when you return. It has 18 pages full of different useful information to fly safely. The booklet has a 10 x 15 cm format and a specific binder allowing it to be easily used while flying. If you are a club member, it’s free. Our airfield is located on a small plateau surrounded by mountains. If you have any questions concerning this landing advice, feel free to mention it to one of our instructors during the daily briefing or at another occasion if necessary. If you judge it necessary to have a test flight when we have Mistral conditions, please ask the instructor for the flight in a double-seater. During a tow, the cable could break at the worst moment ever, while taking off. Have you found and checked the field below on the North West side of the runway, just in case? Following a cable break at low altitude, and it is impossible to safely return to the airfield. You have flown in an area where there are many gliders, paragliders, etc. 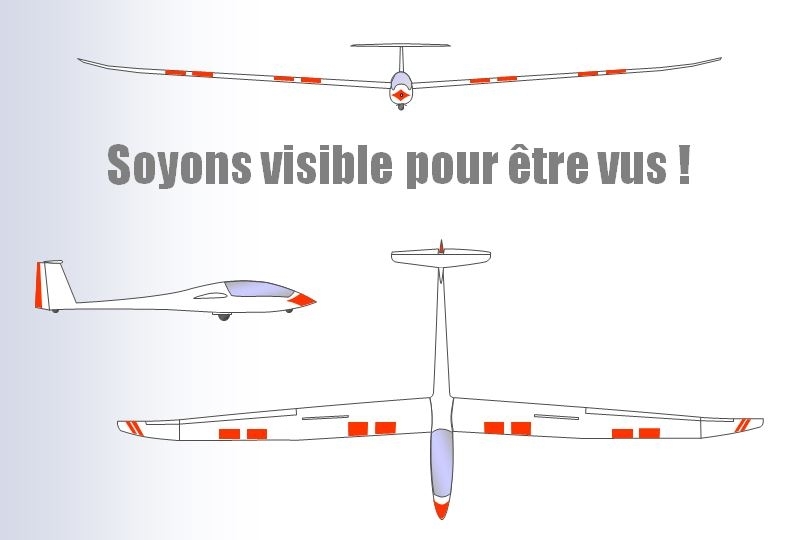 So, it’s mandatory that your glider be perfectly visible to other aircrafts to avoid flight collisions. If necessary, we have some red or orange tape at your disposal. BE VISIBLE TO BE SEEN ! 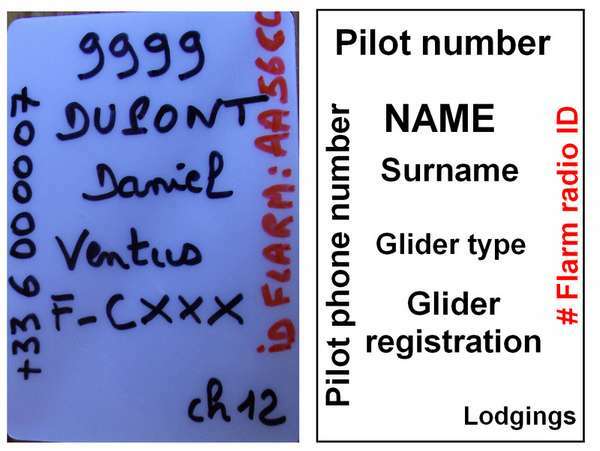 For your security as well as for other glider pilots, it is also essential that your glider be equipped with an anti-collision warning system “FLARM”. Your FLARM software must be up to date . After your flights, verify that your installation (emission/reception antenna position in your glider) is correctly positioned and that it does detect other gliders at a sufficient distance. 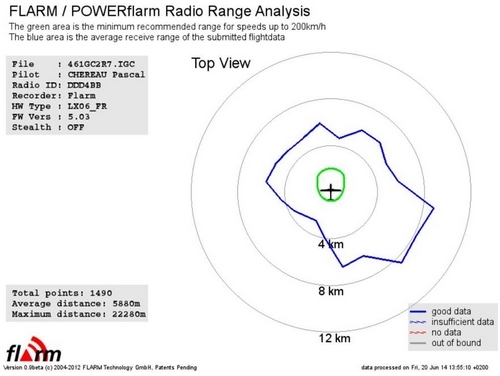 To do this, after several flights and having retrieved your .igc flight files, use this software which gives you an overview of your FLARM installation performance. You can buy the Outlanding Catalog edited by the French Gliding Federation. Read it attentively and bring it with you during your flight. Every field has the same number as on the 1/250 000 glider maps (also sold in the office). On the days you aren’t flying, why not take the opportunity to drive and check out certain specific fields? Mountain flights bring a very satisfying sensation but remain very demanding and require quite a lot of caution. Don’t hesitate to stop by the office to consult the Outlanding Catalog. You have never flown in the mountains? Don’t improvise, start by reserving a specific training with one of our instructors. Please bear in mind : Oxygen is mandatory above 3300 m ( FL100 ). If you feel tired, be smart and abort your flight or take-off later. Take opportunity to discover some activities in the area, or just relax by the swimming pool on the campsite.